WASHINGTON — To say that short-range air defense is making a comeback would be an understatement; ready-to-go solutions to rapidly bring the capability back into service to address today’s threats are coming out of the woodwork. Companies all over the showroom floor at the Association of the U.S. Army’s annual convention last week brought SHORAD offerings to pitch to service officials roaming the massive two floors of expo halls. Defense News Weekly looks into what the Army has deemed its most urgent capability gap—short range air defense. Jeff Martin looks at the Army’s current system—and what the Army might replace them with. What is most noticeable about the solutions at AUSA is nearly all of them take systems and platforms already in the Army’s inventory and reinvent them into mobile systems designed to take out air threats from unmanned aircraft systems to larger helicopters and manned aircraft. Some even had the added capability of defending against ground threats. The solutions that are cropping up also reveal how industry is thinking about getting after an urgent need. While many use platforms that have been in the Army inventory, several companies, such as BAE Systems and Orbital ATK, are combining newer tools for a multilayered approach. And many of the solutions acknowledge that counter-UAS and SHORAD capabilities can be combined into multipurpose systems. It’s been well over a year since U.S. Army Europe identified the SHORAD capability gap, acknowledging both the growing threat of small drones observed on the Ukrainian border by the Russian military and the realization that a key assumption held by the U.S. military for years that it will have air dominance against adversaries will undeniably be challenged. The Army also took critical steps over the past year to rapidly fill the capability gap in Europe with Avenger SHORAD units resident only in the National Guard, deploying them rapidly to the region. At the same time, the service began to look at interim solutions to fill the gap with a plan to ultimately develop a new SHORAD system down the road. The service hosted a demonstration in September where companies could provide solutions on their dime to prove to the Army they had systems ready to go. Four SHORAD systems were demonstrated, according to Barry Pike, the service’s program executive officer for Army Missiles and Space. Pike said the program to fill the SHORAD gap is “moving rapidly ahead” and that the Army saw some “promising” capability at White Sands. But the Army‘s reconnaissance on SHORAD capability is unfinished, and the service will continue to look across industry for solutions. Israeli company Rafael brought Iron Dome to the demonstration. Raytheon would be the lead integrator should it be chosen as a SHORAD option for the Army. General Dynamics Land Systems and Boeing brought an Avenger launcher mounted on a Stryker combat vehicle, marrying two systems already in the Army inventory. Lockheed Martin’s Longbow Hellfire missiles were fired from the system. According to several sources, Hanwha, a South Korean defense company, brought its Biho Flying Tiger air-defense system to the demonstration. Hanwha showcased Flying Tiger at a large booth at AUSA, but declined requests for an interview there. Pike told Defense News that Orbital ATK also demonstrated a SHORAD system — the Tactical-Robotic Exterminator — at White Sands Missile Range, solving the mystery of the fourth vendor that tested its wares. 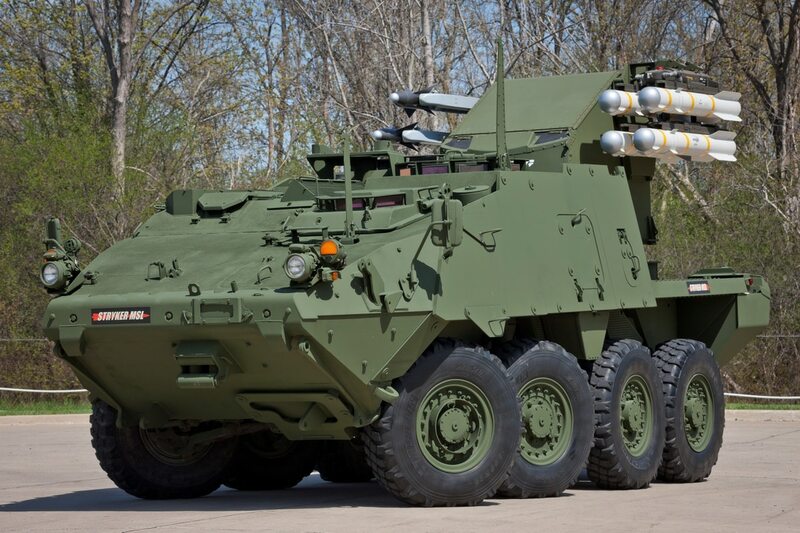 The company’s solution offers a high level of flexibility, according Dave Dorman, Orbital ATK’s vice president for defense and government relations within its armaments systems sector, combining Liteye’s anti-UAV defense system, nonlethal electronic attack radio-frequency jammer and a gun with guided and air-burst munitions mounted on a Stryker. The AUDS — a counter-UAS system — has been deployed by the Defense Department into U.S. Central Command’s area of operation and has effectively “drowned” more than 500 drones with electronic attack, Dorman said. While CENTCOM bought the tripod-mounted version of the system, displayed at AUSA, users in theater mounted them on pallets and armored vehicles and started moving them around the battlefield, which generated a requirement for mounted systems. The company is now working to field the system on MRAP All-Terrain Vehicles, Dorman added. At the same time, Orbital is integrating its XM914 chain gun used on Apache attack helicopters and is slewing that gun to the command and control of the AUDS, which has a 360-degree capability of detecting class 1 and class 2 drones very close in but also out to an extended range, according to Dorman. The chain gun, loaded with 30mm, proximity-fuse rounds of ammunition, is seen as good solution to take out UAS, he said. At the demonstration, Orbital was able to detect, track and slew the gun to engage ground targets. Dorman said Orbital offers a layered approach when combined with other systems because it can cover close-in targets while other systems meet the Army’s desire to detect and defeat drones roughly 15 kilometers out. The capability also demonstrated it can complement the Army’s existing radar sensors like the Sentinel and the Q-50. Orbital ATK provided the 30mm cannon for up-gunned Strykers headed to Europe, so it seeks to leverage that experience to create a mobile SHORAD solution, most likely in partnership with other companies to meet what the Army’s anticipated requirements might be. Orbital’s gun or AUDS could be integrated onto another solution such as the General Dynamics Land Systems and Boeing Stryker-Avenger system. Several companies came forward for the first time with SHORAD solutions at AUSA. BAE Systems pulled an early version of its Bradley fighting vehicle with an air defense history — the Linebacker variant — back into the forefront at AUSA. The Bradley Linebacker was equipped with a search radar on the turret, a fire-control radar, a non-kinetic lethality mechanism — essentially a jammer — and a 30mm cannon with an air-burst munition for kinetic kills. On the other side of the vehicle, the company affixed a missile launcher that can accommodate Stinger, AIM-9X missiles “or anything else the Army wants to use,” Mark Signorelli, company vice president for strategy and business development for the platform and services sector, told Defense News in an interview at AUSA. Signorelli noted the maintenance would be easy and low-cost because the system is on the same chassis as Bradley and retains the same sites and cannon. And the same collection of systems that make up a mobile SHORAD offering could go on a different vehicle if the Army chooses to go that route, Signorelli said, such as an Armored Multi-Purpose Vehicle. BAE is currently delivering prototypes to the Army ahead of a milestone C production decision. Oshkosh Defense turned its Joint Light Tactical Vehicle — the Army’s Humvee replacement — into a mobile SHORAD system, configuring onto the vehicle an Avenger system with Longbow Hellfire missiles and a .50-caliber weapon. And Raytheon, while it wasn’t displayed, touted a recent solution — tested at a separate demonstration at White Sands — of a Stryker with Stinger missiles, which successfully took out a UAS target on the first try. The company also rolled out a high-energy laser dune buggy at the show designed to take out small drones, but the solution is farther afield and only addresses the counter-UAS portion of SHORAD. Lockheed Martin, while not proposing an end-to-end solution, featured already fielded capabilities from a Q-53 counter-fire radar to a wide variety of interceptors that could be incorporated into a SHORAD solution. The Q-53 is being programmed to detect UAS, and Lockheed’s Longbow missiles have been successful in tests against airborne targets such as helicopters while providing cross-domain fires capability, said Tim Cahill, Lockheed’s integrated air-and-missile defense vice president for the company’s Missiles and Fire Control business. Looking farther out as the Army develops SHORAD capability beyond an interim solution, Lockheed sees its Miniature Hit-to-Kill interceptor as an attractive solution. At only 30 inches long and weighing just 5 pounds, it has the capability to go after rockets, artillery and mortars. The interceptors could fit in a 36-pack on a ground vehicle, Cahill said. Jeff Martin, Defense News staff, contributed to this report.